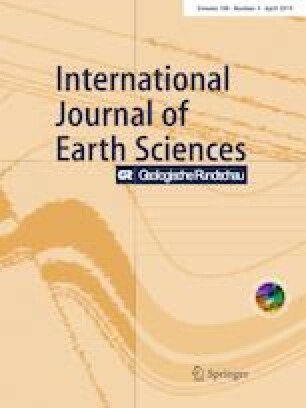 Diagenetic conditions controlling authigenic formation of anatase and in situ LA-ICP-MS U–Pb isotope dating of this phase are studied in Upper Rotliegend II sandstones from two wells in NW-Germany. Anatase grew after breakdown of detrital Ti-phases (e.g. ilmenite) although local scale Ti transport and mobilization from detrital clay-hematite coats or condensed hydrocarbons cannot be ruled out. The anatase-forming reaction marks the change from a regime of reducing conditions imposed by first hydrocarbon generation to oxidizing conditions, probably caused by influx of a fluid from evaporitic Zechstein rocks. This change in fluid influx is interpreted as response to enhanced normal faulting and halokinesis during accelerated burial in Triassic times. Isotope data of U and Pb indicate incorporation of crustal common Pb from Mesozoic pore fluids but precisely mark diagenetic growth of anatase at 224.3 + 5.1/− 5.6 Ma in a Tera-Wasserburg plot. Locally, U–Pb isotope signatures are consistent with either additional incorporation of U and Pb from detrital precursor phases or with uptake of uranogenic Pb from hydrocarbons generated prior to 224 Ma. Anatase is shown to be a valuable authigenic phase suitable for U–Pb chronometry of diagenetic events, which appears to be unaffected by protracted burial and temperatures exceeding temperatures of crystallization. This paper is a late result of Wintershall and RWTH Aachen University Tight Gas Initiative. We thank Wintershall Holding GmbH for supporting this project as well as for providing samples and data. The valuable help of Thomas Derichs and Roman Klinghardt during preparation of thin sections and performance of electron microprobe analyses is gratefully acknowledged. The manuscript was improved by helpful reviews by R. Gaupp and A. Willner.